An Arianespace Ariane 5 rocket launches spaceward Oct. 1, 2009 carrying the Amazonas 2 and COMSATBw 1 satellites. Liftoff occurred at 2159 GMT (5:59 p.m. EDT) from the Guiana Space Center on the northeastern shore of South America. 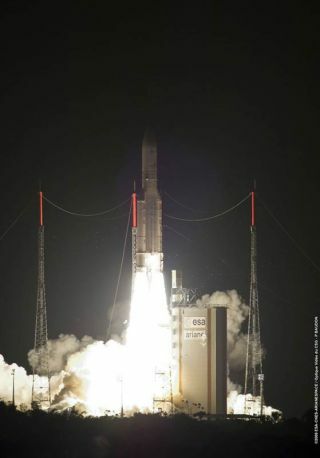 Continuing an enviablestring of success, the Ariane 5 team flew its fifth rocket of the year Thursdaynight topped with a high performance Spanish broadcasting satellite and asecure German military communications craft. Liftoff into clear skiesoccurred precisely on time at 2159 GMT (5:59 p.m. EDT) from the Guiana SpaceCenter on the northeastern shore of South America. The Ariane soared eastward on a poweredflight lasting nearly 25 minutes to the targeted geosynchronous transfer orbit. After the cryogenic engineof the upper stage completed firing, the rocket performed a series ofautonomous maneuvers to deploy Amazonas 2, a commercial telecommunicationsspacecraft to cover the Americas, and COMSATBw 1, an orbiting relay platformfor the German Ministry of Defence. "I think you have seena perfect launch," Jean-Yves Le Gall, chairman and CEO of Arianespace,told his customers observing the flight in the control center. The Ariane achieved ahighly elliptical orbit stretching 22,345 miles at its farthest point fromEarth and 155 miles at the nearest. The satellites will use their onboardengines to circularize the orbit and reach geostationary slots, with Amazonas 2planning three burns and COMSATBw 1 needing four maneuvers over the nextseveral days. EADS Astrium built Amazonas2 spacecraft using the Eurostar E3000 model offering. The 12,000-poundsatellite is equipped with 54 Ku-band and 10 C-band transponders forcommunications services to North, Central and South America. "Amazonas 2 is themost powerful satellite built by Astrium up to now," said Antonio Abad,the Amazonas 2 spacecraft mission director. Satellite operatorHISPASAT, headquartered in Madrid, will add Amazonas 2 into its fleet ofcommunications spacecraft. The commercial success of the company's Amazonas 1satellite, deployed in 2004, prompted development of this follow-on powerhousespacecraft. Amazonas 2 has 25 percentmore transponders, 60 percent more power while only having 20 percent more massthan Amazonas 1, Abad said. "With Amazonas 2,HISPASAT doubles its capacity over America and consolidates its leadership onthis continent," said Petra Mateos-Aparicio, president of HISPASAT. "It is atechnologically advanced, high performance satellite that allows HISPASAT toincrease its range of high quality communications services. With its 64transponders, Amazonas 2 is the largest satellite with pan-American coverageand it positions HISPASAT as the benchmark satellite operator in Spanish andPortuguese speaking markets." Amazonas 2 will be parkedin geostationary orbit at 61 degrees West longitude. It can reach from Alaskato Tierra del Fuego. COMSATBw 1 is the first oftwo such satellites that will be launched in a program for the German ArmedForces' own military communications architecture. Secure and reliabletransmissions via this satellite, plus the sister-craft going up early nextyear, will enable voice and data relay, video and multimedia broadcasting. "Troops in the fieldwill have better connection back to home and within the field. Betterconnection means higher data rates, more services, better services, more robustcommunication and greater flexibility," said Ludwig Laux, chief technicalofficer MILSAT Services, the prime contractor the satellite system. Constructed around ThalesAlenia Space's Spacebus 3000B design, the 5,400-pound craft has foursuper-high-frequency and five ultra-high-frequency transponders. It will bepositioned at 63 degrees East longitude. The two-satellite networkwill cover a zone stretching from the Americas to the Far East, providing anindependent communications link between the German government, military leadersand their deployed forces. Thursday's launch was the33rd consecutive success for the heavy-lift Ariane 5 vehicle, including five missionsjust this year. "From the beginning ofthe year, we have launched seven commercial satellites and two astronomicalsatellites, Herschel and Planck," Le Gall said. Arianespace's next Ariane 5rocket has been stacked atop a mobile launching platform in preparation to receiveits dual communications satellite cargo - the SES World Skies' NSS 12 forcoverage across the Eastern Hemisphere and Telenor's Thor 6 to serve the Nordiccountries. That launch is targeted for October 29. What's more, the rocketslated to fly the year's seventh and final flight has arrived at the launchsite from Europe to begin assembly for its December blastoff. "So as you can see,the end of the year is going to be very busy with two other launches...and 2010will continue at the same pace," said Le Gall.